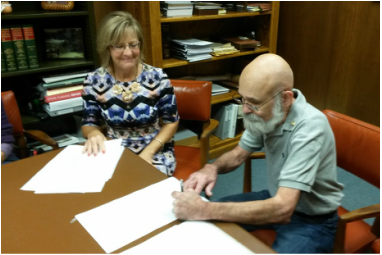 MHAHS President Tony Zalucha signs the paperwork officially transferring the title of the Troll Inn property to the Society. For an organization whose primary focus is in preserving history, the Mount Horeb Area Historical Society has spent an awful lot of time over the past few years thinking about and preparing for the future. And the recently unveiled sketch of a revised and expanded new museum and research center complex seems to indicate that the Society’s future is pretty bright. On Wednesday, September 30th, MHAHS officially took possession of the former Troll Inn building, located at 102 South Second Street in Mount Horeb. The transaction was completed without using any previously raised funds, and was made possible by a generous and visionary anonymous donor specifically for this purpose. The possibility of buying and integrating the Troll Inn property has been internally on the table for several months, as Society Board members struggled with the decision. Though the advantages were obvious and many, the Board was concerned about the possible reactions of already-invested donors and a community previously sold a different vision. The donor, when presented with a sketch similar to that shown here, immediately perceived the benefits of the Society controlling the lot between their already existing properties and offered to donate the funds to make its purchase possible. With this generosity, the Board felt confident moving forward with the acquisition. This key purchase will make it possible to connect and utilize the two Second Street lots already owned by the Society, maximizing the efficiency of the planned new museum and allow for future growth – significant aspects that were inherently lacking in the previous building concept. In addition to the Troll Inn issue, MHAHS has also taken other steps this year to ensure the best facility possible within a realistic budget; a facility that honors the time and knowledge contributed by decades of Society volunteers, that respects the investments of many generous donors and that contributes an enticing visitor destination to the Village and region. Recent developments include a spring series of community listening sessions. Between February and May, MHAHS hosted six such sessions across Southwestern Dane County, including stops in Mount Horeb, Blue Mounds, Perry, Pine Bluff, Vermont and Springdale. Although overall turnout was modest, valuable feedback was collected that helped us grasp how people outside the organization view the Society (as a “hidden gem” that safeguards the area’s historical treasures) and what they hope the new facility will accomplish (continued care of a growing repository of invaluable local history artifacts and archival materials, continued and increased inclusion of constituencies outside Mount Horeb itself, increased pubic programming for all age groups and a physical space designed to accommodate both tourist traffic and researchers). The Society also contracted with Museum Consultant Peter Dajevskis of accomplished public history firm Interpretive Solutions (which has worked with Harpers Ferry Historic Site and American Swedish Historical Museum in Philadelphia, among many others across the country) to complete a review process of the Heritage Center project. The Society tasked Peter with evaluating the project objectives and preliminary plans from the perspective of a longtime museum professional and a heritage tourism expert. After intensive meetings with Society staff, Board members and key volunteers, Peter produced a report documenting his recommendations. Major points included a need to adjust several aspects of the existing plans and construction methods to reflect museum standards and the best-possible traffic flow patterns, while keeping in mind the capabilities of a limited staff. Peter also provided guidance in evaluating the new facility’s climate control – perhaps the most crucial, and certainly the most expensive, element of a building intended to warehouse one-of-a-kind artifacts. Based on the information gathered at the community listening sessions and the direction provided by Mr. Dajevskis, the Society then set about crafting a complete and updated list of “needs” and secondary “wants” – a list that looks very different than it might have just a year ago due the addition of professional staff and the accompanying increased capabilities for educational programming, expanded museum hours and public access for researchers and academics. In fact, with less than one year of service under their belts, the Society’s new Director and Curator have initiated and carried out more than twenty public programs and instances of community outreach in 2015 alone. From a Civil War-themed day camp for kids and free community concert by the renowned First Brigade Band, to an in-class May Day activity at the local elementary school, to an exhibit unveiling reception celebrating the Society’s 40th anniversary, MHAHS staff and volunteers were busy sharing history with all ages. These varied endeavors, carried out using existing limited space and resources, provide an exciting glimpse of just what this “small town Society” will be capable of once in their new facility. The new “campus” concept facility that will be made possible by the Troll Inn purchase will incorporate the functions and spaces that will the project has touted since the beginning: climate-controlled artifact and archival storage, public research room and library, work space for volunteers and staff, comfortable and attractive room for public programs and use by community groups, and an income-generating museum store. But vital shifts in square footage allotments, room adjacencies and construction details have emerged that fit our current needs and the economic realities of ongoing operational expenses. The Board of Directors unanimously approved the finalized list, or architectural program in July and officially re-engaged our architect, Mount Horeb native Bruce Roth, to amend our previous plans with our updated needs and the new opportunities presented by the Troll Inn acquisition. Of course, MHAHS is still in need of contributions to finance the new museum. A construction and interior finishes and equipment budget of approximately $1.6 million is anticipated, with roughly half of that amount now in place due to the generosity of local individuals, longtime area families, businesses and civic organizations. Additional funding will also be sought to establish an endowment fund to help offset future operations costs. A tentative time line calls for a ground-breaking sometime near the middle of 2016, although this is dependent upon the continued success of the Society’s fundraising efforts. Interested parties and potential donors can contact MHAHS Director Destinee Udelhoven at 608-437-6486 or by email at mthorebhistory@mhtc.net.